Christopher T. Russell, UCLAprofessor of geophysics and spacephysics, has spent 15 years working on NASA's Dawn mission to thedoughnut-shaped asteroid belt between Mars and Jupiter. As the scheduled July 7 launch from Cape Canaveral nears, Russell is ready, and so is Dawn. "The spacecraft will spendmuch less time in space than we put in preparing for the mission," saidRussell, the mission's principal investigator. "I want to get this spacecraftup in space, where it belongs. I'm really confident about the spacecraft. We'vebeen testing and retesting." Dawn will conduct a detailedstudy of the structure and composition of two of the first bodies formed in oursolar system: the "dwarf planet" Ceres and the massive asteroid Vesta. Themission's goals include determining the shape, size, composition, internalstructure, and the tectonic and thermal evolution of Vesta and Ceres. Dawn, which will be the first spacecraft to orbittwo planetary bodies on the same mission, is expectedto reveal the conditions under which these objects formed. Comparingtheir different evolutionary paths will provide evidence about the role of sizeand water in planetary evolution. Dawn is scheduled to fly pastMars by April 2009, and after more than four years of travel, the spacecraftwill rendezvous with Vesta in 2011. The spacecraft will orbit Vesta forapproximately nine months, studying its structure and composition. In 2012,Dawn will leave for a three-year cruise to Ceres. Dawn will rendezvous withCeres and begin orbit in 2015, conducting studies and observations for at leastfive months. "I think of Dawn as twojourneys," said Russell, who proposed the mission to NASA. "One is a journeyinto space. This is analogous to what ancient explorers did, who knew there wasunexplored territory and wanted to discover what was there. We'regoing to explore a region for the first time to find out what the conditionsare today. "Dawn is also a journey backin time. Ceres and Vesta have been altered much less than other bodies. TheEarth is changing all the time; the Earth hides its history, but we believethat Ceres and Vesta, formed more than 4.6 billion years ago, have preservedtheir early record. They're revealing information that was frozen into theirancient surfaces. By looking at the surface and how it wasmodified by the bombardment of meteoroids, we will get an idea of what theearly conditions of Ceres and Vesta were and how they changed. So Dawnis a history trip too. We're going back in time to the early solar system." "Evidence indicates it hassubstantial water or ice beneath its rocky crust," Russell said. "Ourinstruments on board will be able to determine whether there is water." Dawn's instruments include agamma ray and neutron spectrometer that can detect the hydrogen from water. Evidence of whether waterstill exists on Ceres could come from frost or vapor on the surface, andpossibly liquid water under the surface. The water kept Ceres cool throughoutits evolution. In contrast, Vesta was hot, melted internally and becamevolcanic early in its development. Ceres remains closer to its primordial state,while Vesta evolved further over the first few millions of years of its existence,Russell said. Ceres, named for the Romangoddess of agriculture, revolves around the sun every 4.6 terrestrial years andhas an average diameter of approximately 600 miles. A roughly round object,Ceres orbits the sun in the asteroid belt between Mars and Jupiter,approximately 258 million miles from Earth. Ceres is much larger than Vesta —more than two times further across, with a volume eight or nine times greater —but is less dense, as the material in it is lighter. Vesta, the brightest asteroid,is named for the ancient Roman goddess of the hearth. Approximately 220 millionmiles from Earth, it appears to be essentially solid rock, with a densitysimilar to Mars. It orbits the sun every 3.6 terrestrial years, has an oval,pumpkin-like shape, and has an average diameter of approximately 320 miles.Vesta's basaltic dust layer reflects its crustalcomposition, and its dry surface includes a huge crater near its southern pole. Studies of meteoritesbelieved to be from Vesta that were found on Earth suggest that this bodyformed from galactic dust during the solar system's first 3 to 10 millionyears. Although no meteorites from Ceres have been found, it is believed thisbody also formed during the first 10 million years of the solar system's existence,Russell said. Dawn is expected to bringhigh-resolution images of previously unseen worlds tothe public, including, perhaps, mountains, canyons, craters and ancient lavaflows. In addition to the images, Dawn will generate data thatwill help scientists identify geologic minerals and will take measurements ofgamma rays and neutrons. The gamma-ray measurements will reveal which elementsare in the minerals. The data are expected to arrive a scant 30 minutes afterthe spacecraft obtains them. Dawn, which will orbit asclose as 125 miles from Ceres and Vesta, is the first purely scientific missiondesigned to be powered by an advanced NASA technology known as ion propulsion.Unlike chemical rocket engines, ion engines accelerate their fuel nearly continuously,giving each ion a tremendous burst of speed. The fuel used by an ion engine isxenon, a gas also used in photo-flash units, which is more than four timesheavier than air. This results in a xenon atom with a positive charge — a xenonion. The xenon ions shoot out the back of the engine at a speed of 78,000 milesper hour. At full throttle, the ionengine consumes 2,300 watts of electrical power and produces 1/50th of a poundof thrust — about the same pressure as a sheet of paper resting on the palm ofa hand, and far less thrust than is produced by even small chemical rockets.This engine, for a given amount of fuel, can gradually increase a spacecraft'svelocity 10 times more than can a conventional rocket powered by liquid orsolid fuel. The management of theDawn launch is the responsibility of NASA's KennedySpace Centerin Florida.Delta II Heavy launch service is provided by United Launch Alliance, in Denver. 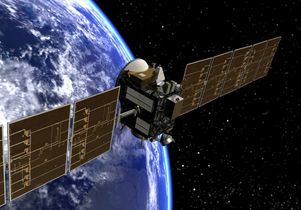 The Dawn missionis managed by JPL, a division of the California Institute of Technology in Pasadena, for NASA'sScience Mission Directorate. Other scientific partnersinclude Los Alamos National Laboratory, in New Mexico;Max Planck Institute for Solar System Research, in Katlenburg,Germany; DLR Institute forPlanetary Research, in Berlin, Germany; Freie Universitaet in Berlin,Germany; Italian NationalInstitute for Astrophysics, in Rome;the Italian Space Agency. Orbital Sciences Corporation of Dulles, Virginia,designed and built the Dawn spacecraft. UCLA is in charge of Dawn'sscience and public outreach. Russell leads the science team, brings togetherthe mission's partners, manages the budget and participates in all majordecisions. Russell and his colleagues will make science decisions and developthe operations plans through the science center at UCLA's Institute of Geophysicsand Planetary Physics. His science team has the lead role for analyzing andinterpreting the data from Dawn. UCLA graduate students and postdoctoralscholars will work on the mission, including helping to analyze the data fromDawn. Dawn is part of NASA'sDiscovery Program, in which scientists find innovative ways to unlock themysteries of our solar system by answering some of humanity's oldest questions. "Why do we explore the solarsystem?" asked Russell, who has published more than 1,000 scientific papers. "Whydid Lewis and Clark go across the U.S. at the start of the 19thcentury? We're not going to expand the human race off this planet for a longtime, but discovering our origins and how the solar system evolved is valuablein itself. Mankind has always expanded horizons. Exploration is a humanimperative." Team members includescientists from the Jet Propulsion Laboratory, the NASA Goddard Space Flight Center, the U.S.Department of Energy's Los Alamos National Laboratory, the MassachusettsInstitute of Technology and other institutions. Orbital Sciences Corp. isbuilding the spacecraft, and JPL is providing the ion engines. "I'm putting my entire beinginto doing this mission; it's all-consuming, but fun," said Russell of the80-hour weeks he has been working. For more information, visitDawn's Web site at http://dawn.jpl.nasa.gov. Dawn will journey to the asteroid belt between Mars and Jupiter. UCLA Professor Christopher Russell leads NASA’s Dawn mission, a journey through space and time. 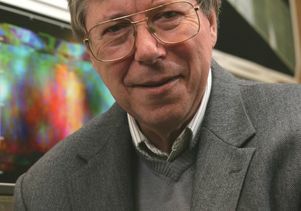 UCLA Professor Christopher T. Russell is Dawn's principal investigator.